We are introduced to Leyna (Amandla Stenberg, “The Hunger Games”), the daughter of an unnamed French African soldier and a German mother (Abbie Cornish, “Three Billboards Outside Ebbing, Missouri,” “Bright Star”), in the Spring of 1944 in the German Rhineland. She has recently turned 16 years old and the Gestapo, Nazi Germany’s secret state police, has taken an interest in her. Desperate to keep her daughter out of harm’s way, Leyna’s mother flees to Berlin with both her and Leyna’s younger half-brother where she mistakenly believes they can disappear. Leyna’s aunt and uncle don’t want her around nor does the school she briefly attends. All the while, Leyna catches the eye of Lutz (George MacKay, “Captain Fantastic”), a teenage boy who is an active member of the Hitler Youth and whose father (Christopher Eccleston (“Doctor Who,” “Thor: The Dark World”) is an officer in the Nazi SS. As she begins to fall under increased scrutiny, Leyna and Lutz develop a romance, much to the chagrin of Leyna’s mother who warns her it will only lead to their ruin. The budding teen romance, which becomes sexual, is suddenly halted when Lutz is called up to the Russian front by increasingly desperate Nazi regime and Leyna is hauled off to a concentration camp. Historically speaking, writer/director Amma Asante (“Belle,” “A Way of Life”) does a sound job of portraying the ever-looming danger African Germans had to endure. Through Leyna’s terrified eyes we also see the atrocities committed against anyone else the Nazis deemed not human, best epitomized in a shocking execution scene. However, the damage caused by the bombing of Berlin by the Allies during the winter of 1943-44 is barely reflected on camera and the concentration camp scenes misfire. Cornish delivers a performance that deftly captures a mother’s desperation and Eccleston shines as a father who makes a ghastly decision. Beyond that, the acting is mediocre at best and downright clumsy at worst. It often feels like an overly long, bad stage play, with uninspiring camera work in the beginning despite Asante’s good intentions. 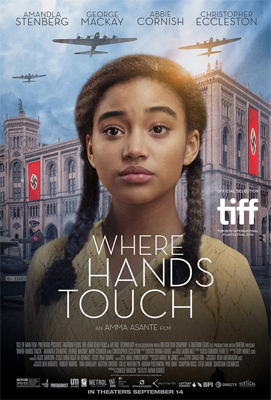 “Where Hands Touch” is certainly a work cinema brimming with good intentions as it’s a story that should be told amidst a myriad of Holocaust-related stories which should never be forgotten. Unfortunately, the quality of work is less than average. Normally, I am not a huge fan of sports films. Just not my thing, but I decided to check this out due to the talent. Robert De Niro, Edgar Ramírez, Usher Raymond, Ellen Barkin all deliver great performances. I enjoyed the film but it is what I calla a one-timer, I don’t ever see myself revisiting this one and I have a feeling that people are going to forget it as well quite quickly if not already. Official Premise: Hands of Stone follows the life of Roberto Durán (Edgar Ramírez), the Panamanian fighter who, with the help of his trainer Ray Arcel (Robert De Niro) made his professional debut in 1968 as a 16 year old and retired in 2002 at the age of 50. In June 1980, he defeated Sugar Ray Leonard (Usher Raymond) to capture the WBC welterweight title, but shocked the boxing world by returning to his corner in their November rematch, famously saying the words ‘no más’ (‘no more’). The “Hands of Stone” Blu-ray comes with a Digital HD copy. The 1080p transfer is sharp and packs as punch as does the DTS-Master Audio 5.1 track, which worked with the boxing. The special features are nothing special either. There is a featurette going behind-the-scenes on the star boxer in “Roberto Durán: A Boxing Legend, a Nation’s Pride”. Other than that, there are only a few deleted scenes, and two lyric videos. Something about Jack the Ripper has always fascinated me. I think I am not the only one either. The mystery behind this character has been reproduced in cinema for many many years and it never gets old. Hammer delivered yet another Gothic and very brutal, while still unique approach to the character in this film. This film has also been noted as being one of the most gruesome Hammer horror films ever made and that is not an exaggeration. This Blu-ray also features footage never before seen and is completely uncut. So that should make fans very happy. Synapse Films has been behind releasing these classic films on Blu-ray with fantastic transfer and a wealth of special features. Keep them coming guys! A must purchase for any fans of Hammer. Official Premise: An infant girl watches in horror as her father, the infamous Jack the Ripper, brutally murders her mother. Years later, young Anna (Angharad Rees) is now under the care of a fake psychic and has been forced into prostitution. At the end of a séance one evening, a woman is mysteriously killed. Dr. John Pritchard (Eric Porter) suspects Anna is the murderer but cannot understand how she could do this unspeakable act. Using new Freudian psychoanalysis techniques, Pritchard experiments on Anna and discovers a shocking secret. The spirit of the Ripper is alive and well, and may be possessing his own daughter! Can this evil be stopped before it’s too late? Synapse Films is releasing “Hands of the Ripper” as part of their Hammer Horror Collection and as a Blu-ray + DVD combo pack. The film has been completely restored in high-definition and released uncut for the first time on Blu-ray in the U.S. The 1080p transfer looks stunning with its widescreen (1.66:1) presentation. There is a fantastic DTS-HD Master Audio 2.0 track included as well, which complements every scream and the film’s amazing score. The special features are not too bad and worth checking out for Hammer fans. There is a great featurette in “The Devil’s Bloody Plaything: Possessed by Hands of the Ripper”, it clocks in just short of 30 minutes and packs some interesting interviews. “Slaughter of Innocence: The Evolution of Hammer Gore” is a neat motion still gallery. There is the U.S. television introduction and original theatrical trailer and TV spots. But the real score of this release for myself is the isolated music and effects audio tracks included. I would highly recommend that for any true Hammer fan!